Two like-minded professionals saw the same vision: opening a dedicated aerial space in their town. 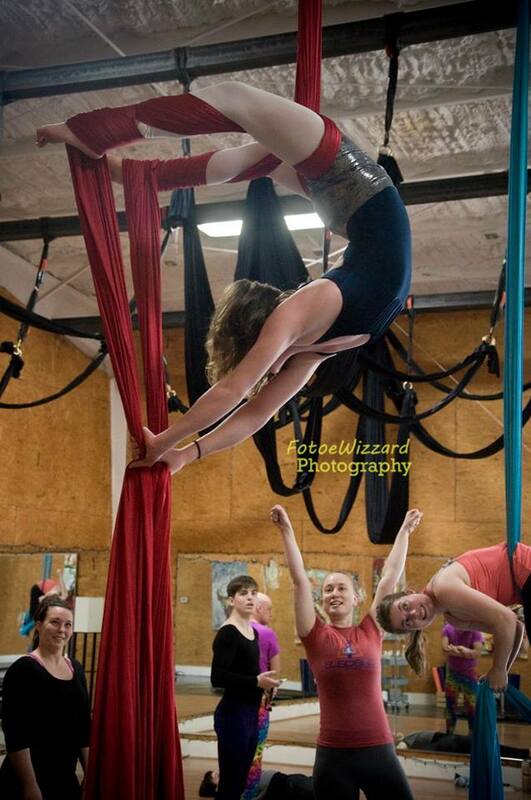 Meg Johnson Wallace, a University Professor, and Anne Boock Miller, a neuropsychologist, connected four years ago over their common enjoyment of the aerial arts. 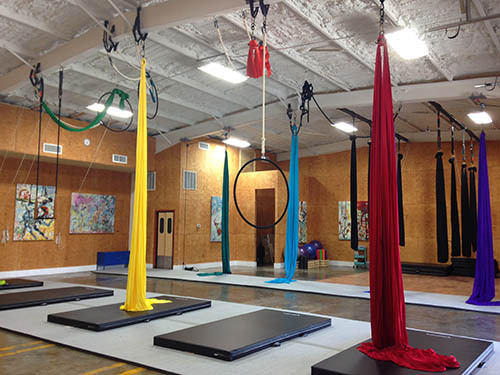 In March 2015, they decided to co-found Suspend, Louisville’s first and only facility dedicated exclusively to aerial arts and cirque fitness. The dynamic duo have undoubtedly stumbled found the secrets to a successfully run studio, and they’ve given me permission to share some of them with you. It’s not that they have other careers-It’s that they are smart women! In what she jokingly calls her “big girl job”, Meg is a professor of Philosophy, with a specialization in metaphysics. Anne’s knowledge of the brain translates to how she relates to students. She can work with anyone, of any ability, and it has had a wonderful impact on the culture of the studio. It has even influenced studio policy in indirect ways because she understands how various age groups function. This kind of intentional decision shows up in every detail of their business, to how they label classes, to the way they advertise. I wish every studio thought about their choices with as much clarity of the end goal as these women have done. They spot every person on every apparatus from day one and continue their heavy support through the learning process (lightening up for advanced students when appropriate). Their safety is further bolstered with thick crash mats under every apparatus, on top of gymnastics flooring (which can be rolled back and easily moved around the room). While I was at the studio, I got the chance to observe a beginning fabric class. Many studios may spot selectively or let people to explore on their own after they have tried on their own so that people get more time on the fabric. At Suspend, 8 students watch their classmates take their turns on one fabric so that each student can individually be guided and spotted. At first, I thought this kind of spotting was excessive because students get so little airtime, but as I kept watching the class, there was a moment where one person started slipping out of their position. The instructor was right there to catch them and everyone watching was learning more about how to move or not move. Because Suspend is a heavy-spotting studio, as well as the other choices they have made in setting up their studio, they have attracted people who might not normally fit the mold of who takes aerial. One of my favorite students of theirs was a young girl with Cochlear implants. She was taking class with a young boy with glasses. The young boy asked her what those things on her head were, and her mom explained, “These help her to hear better just like glasses help you see better. In a way, these are like glasses for her ears.” It was such a precious moment to watch. Not only were the children enjoying class, but the parents were right in there, trading off on the hoop as well. They have an amazing support system. Not only do Meg and Anne have each other to lean on for continual support, but they have highly supportive families supporting them. Meg’s husband is a computer guru and has given the studio support for their website. Anne’s husband is a lawyer. He has contributed his consulting skills, including helping with all the proper permits to be up to city codes, etc. On Suspend’s website, they describe their classes: “Classes are designed to improve strength, flexibility, focus, balance, and poise in a playful and inspiring atmosphere, which encourages health and community.” These goals have been set and they are reaching them. I have witnessed first-hand the wonderful community that they are growing, and I’m excited to see what happens next for them. Anne taught me a modern dance sequence on the ground. (Note how the picture shows a very classic modern dance movement.) After we learned the sequence on the ground, we took it to the air. Note: a Palindrome is a sequence that mirrors itself like racecar or 3245423. In this case, it’s a movement sequence. These mats are 4″ thick from GreatMats. We like them a lot! I luv luv the concept!!! I would love to take an intensive in your studio in Louisville. I live overseas so would have to schedule a block of time to do it. 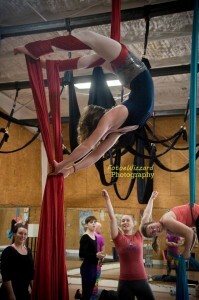 I’m already doing aerial but would like to refine my skills and one day open a studio overseas and teach!! !